If you are looking for an iconic name to add to your portfolio, would General Electric or Verizon be a better fit? When it comes to name recognition, industrial giant General Electric Company (NYSE:GE) and telephony Goliath Verizon Communications Inc. (NYSE:VZ) are economically important, top-of-mind companies. But are they good investments? Here's a quick look at GE and Verizon to see if either one should have a place in your portfolio today. General Electric's troubles are headline-grabbing news today. That said, the trials and tribulations of this company date back to before the deep-2007-to-2009 recession. Leading up to that downturn, the company allowed its finance wing to expand well beyond its core purpose. Industrial companies like GE often have large finance arms, but they are intended to help facilitate the purchase of company-made products. 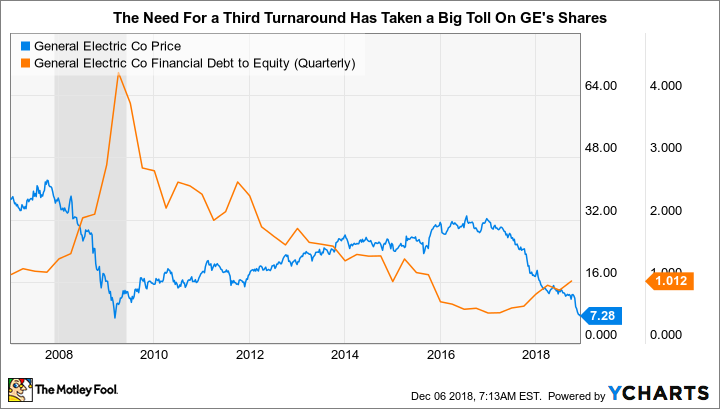 GE's finance division spread to include things like mortgage financing, which was way beyond the company's industrial focus and, unfortunately, a key factor in the recession. When that finance-led recession hit, GE was forced to cut its dividend, take large one-time charges, sell off assets, and accept a government bailout. After a tough stretch in which it refocused around its industrial business, it looked like GE had finally regained its footing. Big acquisitions, including Alstom's power business and most of energy-focused Baker Hughes, were undertaken to shift the company back into growth mode. When growth didn't live up to expectations, however, the company jettisoned its CEO and announced that there was trouble with the turnaround plan. More asset sales, write-offs, and a dividend cut were the solution again. Around a year after that change of course, the company again fired the CEO, this time bringing in a company outsider to run things. Another round of asset sales, write-offs, and a dividend cut (the annual dividend is now a token $0.04 per share per year) were the medicine. It probably shouldn't be surprising to find that the stock has been battered by all of these negative developments. In fact, the stock is trading about where it was during the depths of the 2007-to-2009 recession. There's noteworthy turnaround potential here, but there's also huge risk since the third turnaround effort in roughly a decade has only just begun. While special situation investors might be interested in GE, most investors should avoid it until there's clear evidence that this turnaround attempt is different. Verizon, meanwhile, is one of the two main cellular service providers in the United States. That business continues to do reasonably well, with solid subscriber growth through the first nine months of 2018 despite a largely saturated U.S. cell phone market. And it offers a very generous 4% dividend yield, backed by dividend hikes in each of the last 14 calendar years. At this point, it should be an easy call between Verizon and GE. But don't jump just yet. There's a lot going on at Verizon today that should make long-term investors leery. For example, it has to roll out yet another new technology (5G) if it wants to remain competitive. That's going to be a costly affair. Competition has been heating up, with smaller players pushing low-priced cell plans that have forced larger peers like Verizon to do the same. And, perhaps more worrying, Verizon has made a big push into content -- something that is way outside its traditional bailiwick. That's the one that I think should have most investors worried. In recent years Verizon purchased both AOL and a portion of Yahoo!, essentially attempting to build a content division out of two iconic-but-well-past-their-prime internet pioneers. Two bad companies added together don't inherently make a good one. In fact, Motley Fool's Nicholas Rossolillo thinks that Verizon may have decided that it can't make what it has dubbed the Oath Division work and will simply try to bleed it for cash until it dies. If this is the case, as it increasingly appears to be, then Verizon will have made a multibillion-dollar mistake with its shareholders' money right at the point when it needs to take up another round of capital spending (on a 5G rollout). With long-term debt at roughly 66% of the capital structure, Verizon shouldn't have too much trouble affording the 5G investment, but that shouldn't give it a pass on the Oath misstep. Sure, Verizon is in better shape than GE, but I'm not convinced that it is a worthy portfolio addition based on what looks like a big capital blunder. VZ Dividend Per Share (Quarterly) data by YCharts. 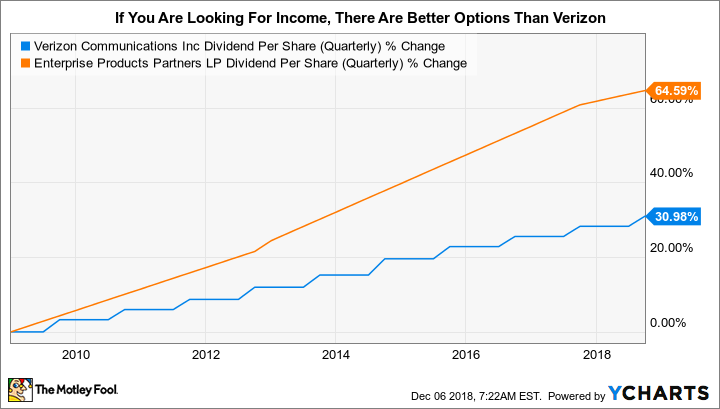 And yet Verizon's 4% yield may still be enticing to dividend investors. But I'd rather buy a bellwether name like Enterprise Products Partners LP (NYSE:EPD) in the midstream space. This partnership is a giant in its industry, has a long history of investing wisely, and has been shifting its business to be even more conservative. Moreover, it offers a 6.6% yield backed by 21 years of annual dividend increases. But the counterpoint doesn't have to be Enterprise -- the real purpose of this example is to show that there are better high-yield stocks out there and that there's no need to settle for Verizon. If you are just looking at GE and Verizon, the answer is pretty simple: Verizon is a much better option today for all but the most aggressive turnaround-focused investors. That said, Verizon has its own warts, notably the questionable choice to build a content arm out of two once-important-but-now-largely-failed internet companies. Yes, the 4% dividend yield might be enticing to income investors, but there are better income stocks out there if you take the time to look. And for that reason I can't suggest Verizon as a good pick, either.